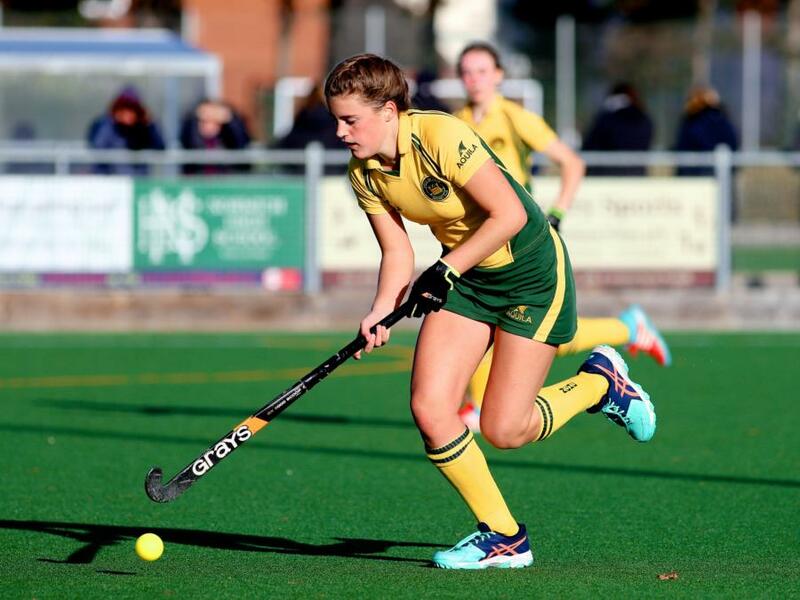 NCHC W2 hosted the strong North Norfolk W1’s side who currently sit 2nd in the league table. After a brief warm up in the winter sunshine, (this time dodging the rabbit holes by using the car park with a stern ‘telling off’ by our very own Frosty) City stepped onto the pitch feeling positive that this would be the week we would walk away three points. However, City were off to a shakey start, it appears all the pre-match sugar and coffee didn’t quite prepare us for the motivated North Norfolk side. North Norfolk pressured City from the whistle and managed to penetrate City’s ‘D’ within the first few minutes to win a short corner. Unfortunately for City, this was converted and left us on the back foot for the next 15/20 mins conceding once more, 0-2. After a bit of composure City arose to the challenge and got their heads into the game. Keeper Serena Scott made some tremendous saves keeping the scoreline low. Defender Leigh-Ann Worrall contributed by her ’sick’ pick-ups in the ‘D’ with the addition of important clearances from herself and half back, Becky Gaffney whose positional awareness provided a much needed outlet. Full back, Kathy Sinnamon gained and kept possession of the ball in vital areas within City’s ’25’ who linked up well with half back, Frankie Birkenhead who made some dangerous overlapping runs on the left hand side. North Norfolk managed to win several more short corners but under Scott’s instructions City’s defence changed their running tactics and denied North Norfolk the backboard. City took advantage of a broken down penalty corner and cleared the ball to midfield who proceeded to find forwards Milly Brown and Hannah Bush who worked together quickly and efficiently up the pitch to find Rachel Phillips who out skilled the lone defender and sent the ball flying past the keeper who was referred to as a ’sitting duck’ by her team mates, 1-2, City were back in the game. After some ‘constructional criticism’ by coach Chris Wardale at half time, City shook off their morning blues and got pumped! City came back and hit North Norfolk hard in the second half making them really work for their three points. Captain Helen Busfield worked tirelessly as always in central midfield linking up well with inside forwards Lucy Tilbrook and Georgia Cleveland who sent some lovely balls into the ‘D’. POTM Rosie Humphrey stood her ground in midfield breaking down play and winning 50:50 balls determined not to let North Norfolk ‘up the ante’. So much so, that both Humphrey and Busfield had the same vision of driving into the oppositions ‘D’ as they charged towards a loose ball colliding with one another, splat on the floor! Minor injuries shaken off for the last ten minutes. City caused havoc in this time and looked as if a draw could be on the cards but unfortunately, just couldn’t make it pay off. Final score, 1-2. Norwich city 2s saw them selves at UEA grounds this Saturday. A young and ‘fresh’ team to take on. We were positive and ready to play some good hockey, which we did! City attacked hard,as UEA had the first push back, and city pressured the opposition. Once we stole the ball off UEA, city were passing the ball around the back fast and strong. The midfield were working hard to break up the screen of blue to break through for a full yellow attack! First goal for city and first of the game was a strong effect from Lucy Tilbrook, pushing her way through the defence and Milly Brown giving the ball a final push, making sure the goal was made! Forwards working hard, keeping the UEA defence on their toes. But UEA were a good team who pulled out two goals. But city came fighting back with another goal from a SUPER short corner sweep from Helen Busfield. Second half found the teams fighting hard once again but unfortunately city started to tire as the opposition sent out their fresh legged subs. This resulted in another UEA goal giving them the lead. Once again city pushed and a fabulous, well practiced, goal came from a huge team effect. The ball was worked from the back line, all the way through to Hannah Jarvis POM, linking with Frankie Birkenhead, who strikes the ball across the D to the far right post, where speedy milly ran to defect then ball into the back of the goal. After a brilliant effect from the whole city team this was not enough as UEA were just that little fast and stronger this time to then add two more goals to make the final score 5-3 to UEA. Norwich will of course come back stronger and faster next time when we play them on our home pitch. NCHC W2 hosted Norwich Dragons W3 on Saturday in almost perfect hockey weather. Following a rousing team talk in the changing rooms by captain Helen Busfield, City headed out to warm up a player short of the 13 expected to take the pitch as Matilda had left her shin pads behind. With the regular warm up of the now customary home-pitch game of 'dodge the rabbit holes' and stretching almost complete Matilda decided to show up having turned back to retrieve them. My eagle-eye noticed that she only had a stick, drink bottle and said shin pads with her when she arrived, so how could she forget them? I don't know, but this sort of behaviour is usually reserved for Hannah Jarvis and Matilda unanimously picked up the never desired FOF award. I digress. Following the thorough and slightly longer on-pitch warm up, City defended the first push back and promptly went on the attack. With forwards Milly Brown, Hannah Jarvis and Rosie Humphrey closing down the Dragons defence we were able to win possession and take control. Following the earlier instructions from Captain Busfield, the inside forwards Georgia Cleveland and Lucy Tilbrook and midfielders/defenders Frankie Birkenhead, Busfield and Kathy Sinnamon were able to thread delightful balls through to others making leading runs and generally causing problems themselves. The pressure soon paid off with a short corner being awarded in our favour. Unfortunately a defensive foot on the line inside the post following a strike by Leigh-Ann Worrall was deemed to not be on target (!!) and another short awarded instead of the anticipated penalty flick. Oh well. Fast-forward a few minutes and after some probing runs by the forwards, they were able to upgrade to deservedly win another PC. This time Worrall was not to be denied and following a neat move, slotted the ball in at the far post. City continued to dominate the battle between the 23's and by changing the points of attack, rapidly transferring the ball around the back between Birkenhead, Megan Conway, Worrall and Sinnamon, Dragons hardly had a look in but when they did foray into our defensive D, Serena Scott in goal had everything under control commanding the area and delivering instructions to the defenders as usual resulting in no troubles. The half time whistle and well deserved break came with no further goals. The 2nd half started and we were immediately back on the attack where we'd left off earlier. Alice Gill and Matilda Warde-Aldam made nuisances of themselves putting Dragons firmly on the back foot creating many changes in the attacking D. Several more penalty corners were awarded and Worrall was able to place a mis-timed shot inside the far post in almost identical fashion to the first making it 2-0. Keeping up the pressure by playing a high defensive line, the City defence were hardly troubled and were able to create further attacks resulting in more chances created by those up front but unfortunately the score was to remain 2-0. This was a great team effort built upon recent good performances with unlucky results and hopefully the turning point for the rest of the season. Next up UEA away and we’ll be aiming for another 3 points. With a strong squad and still buzzing from a well deserved win last week, the girls were ready and raring to get another win. The first 20 minutes were a challenge - a slow pitch saw us trying to settle into our usual type of slick play, but it took longer than we expected. However, a goal from Rosie Humphrey halfway into the first half from a good run from Sophia Basset relaxed the team and we began to play our usual flowing hockey. This was closely followed by a goal from Hannah Jarvis which saw us go into half time with the upper hand. Filled with confidence from our good link up play that we finished the first half with, we started even stronger in the second half. The goals soon followed from Alice Gill, a second from Rosie, and a fabulous team goal that came from slick transferring round the back up to the right wing allowing our debutant player Irene Ramirez to strike an unstoppable shot into the top right corner. This was proceeded by a strong reverse shot from Sophia, a well-executed short corner strike from captain Helen Busfield and finally a follow-up shot from Milly Brown. We did well to keep a clean sheet, especially after Serena Scott’s interesting clearance straight to their centre forward who nearly got a shot away. Maybe this was to spice the game up a bit from a defensive point of view, particularly since Serena only had to touch the ball four times during the whole match! A great performance and a fabulous win - well done girls! We travelled down the A11 to Culford, a much needed caffeine fix for Frankie Birkenhead and we met in changing room 4 for a pre-match talk. A very strict warm up from our illustrious new captain; stretch, sprint, lunge, bellowed aloud. First half start strong for both sides with much of the game from one end of the pitch to the other so long balls through from Frankie and the odd chip, through to Hannah Bush and Lucy Tilbrook, City played their game much to the frustration of Bury who had a couple of decent players hanging around up front. As we got into the first half Bury started to pile on the pressure with strong balls into the D, we changed tack and held our own in what was turning to be a defence first half. Some gritted determination from all of the team - first half finished 0-0. Half time team talk - direct and to the point with the added addition of sugar! Both teams opened up strong with no clear way through play went round the back with three touch hockey we were back in their half, via Rosie Humphrey and Jenny Stanghan not for long as the ball came thundering back, 20mins in Bury won a short corner clearing it off the line, score sheet was still 0-0. City then won a couple of short corners but failed to convert, with a long ball into the D, city keeper came off the line clear the ball and took the player. Bury fought back and with a straight ball sneaked one in the back of the net - 1-0. Play continued with the pressure being piled on we were now playing in our half with everyone back, im not really sure what happed in the second goal as it was a bit hectic in defence with Milly Brown even venturing down there. However the final score was 2-0. There are lots of positives to take from Saturday, so don’t be down hearted, we worked really well as team, true spirit, didn’t give up and you will all have ribbons to wear next week!